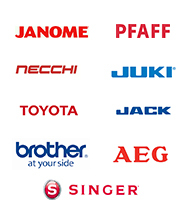 We stock a full range of Industrial sewing machines parts and attachments, including a range of generic parts to fit, Brother, Singer, Juki and Yamato machines and the following. 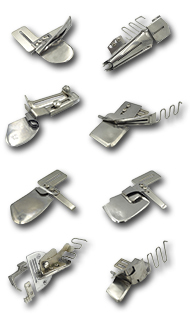 * A range of Organ sewing machine needles & GROZ-BECKERT sewing machine needles. * Hemming feet, Gathering feet, Zip feet, Piping feet, Cording feet, Shirring feet, Roller feet Top stitch feet, Compensating feet. 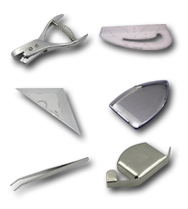 * Binding and Hemming Attachments, Bias binders, Belt Loop folders, Down and Up turn hemmers, Brad Tape binders and many more. 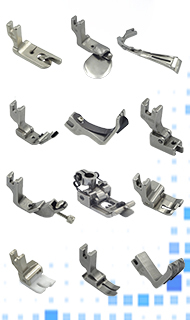 * Sewing Guides, Roller Guides, Magnectic Guides & Attachments. * Tailors Scissors from 7" to 12" all made in Italy along with a range of thread snips.